William Mathias (1934-1992) is one of just a few twentieth century Welsh composers to enjoy a truly international reputation largely due to choral and organ works which cathedral choirs and larger choral communities perform regularly. And Wells Cathedral Choir, one of England's great cathedral choirs, represents a tradition of singing to which Mathias dedicated so much of his artistic talent. 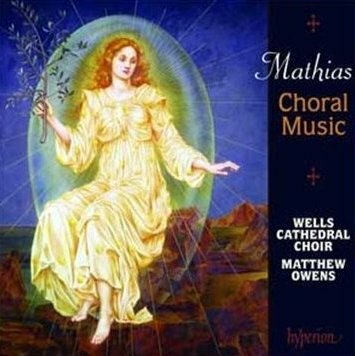 Mathias writes with a highly individual blend of styles drawn from twentieth century British, French and American composers – especially the young Benjamin Britten and also Peter Maxwell Davies – in the way that he absorbs influences from Mediaeval music, creating vocally engaging textures with intense rhythmic drive and pleasingly angular organ accompaniments. However, as Roderic Dunnett points out in his sleeve notes (of Hyperion's usual excellent standard), Mathias was also a symphonist and a master of the string quartet. The album opens with the vibrant 'Let the people praise thee, O God', written for the wedding of Prince Charles and Lady Diana Spencer in 1981, and Wells Cathedral choir bring an enthusiastic energy to this music right from the very start with their outstanding performance. This famous anthem is followed by what I would consider to be one of the best works on the album, the Jesus College Service: a 'Magnificat' and 'Nunc Dimitis' from 1970. The incredible confidence of the 'Magnificat' with is modal lilt and busy rhythmic patterns is balanced beautifully by the tender opening of the 'Nunc Dimitis'. Listen out for the astonishing setting of 'Amen' at the end of the 'Magnificat' which the choir sing with relish. The beautiful macaronic carol 'A babe is born' displays a characteristic sense of urgency so particularly appropriate to the Christmas story and is followed by an earlier carol 'In excelsis gloria' (1954) which Dunnett's notes liken to the texture of organum. After a perky organ solo 'Processional' the central part of this programme is the 'Missa Brevis' (1973), a darker and more reflective work than the evening canticles, again punctuated by a glorious array of sounds from Wells Cathedral organ. The heavy and challenging passagework for men's voices which dominates the 'Kyrie' and 'Gloria' is finally dispelled in the 'Sanctus' with large blocks of joyful choral sound underpinned by more superb organ textures. This is a mass cycle which portrays a definite journey through the Eucharistic service culminating in a beautiful 'Agnus Dei'; if you don’t already know this work, then this disc is an excellent way to meet it. The second half of the programme comprises three more anthems (and motets), another ingenious little organ solo and the 1964 Festival Te Deum and Jubilate Deo (1983). I was particularly drawn to the optimistic 'Lift up your heads, O ye gates' (1969) and I enjoyed the choir's performance, in particular, which was every bit as exciting a the music itself and provided a great set-up for the heart-stopping contrast with the slow hushed beauty of the following unaccompanied 'O nata lux'. Wells Cathedral has a beautiful organ played skillfully and sensitively throughout this album by organist Jonathan Vaughan; he is a wonderful accompanist for Matthias' music which I suspect he makes sound a lot easier than it really is. The choir are also superb which is especially pleasing since I am a great supporter of mixed treble-lines and always welcome successful performances like this that prove they are supporting our priceless cathedral choral tradition rather than threatening to erode it. However, what is really most impressive about Wells Cathedral Choir is the sheer range of colours that their conductor, Matthew Owens, manages to coax out in such tricky music. They really rise to this challenge and can be forgiven the odd moment when they overshoot the mark and become slightly blustery. These are few and far between. This is a fantastic album which I highly recommend.